Manufacturer of these professional hair cutting and thinning shears is Harutake. The English translation of the word “harutake” is “spring bamboo”. Harutake manufactures bags and cases which are specially adapted for carrying or holding hair cutting shears, as well as hair cutting scissors, cutlery, side arms and razors. 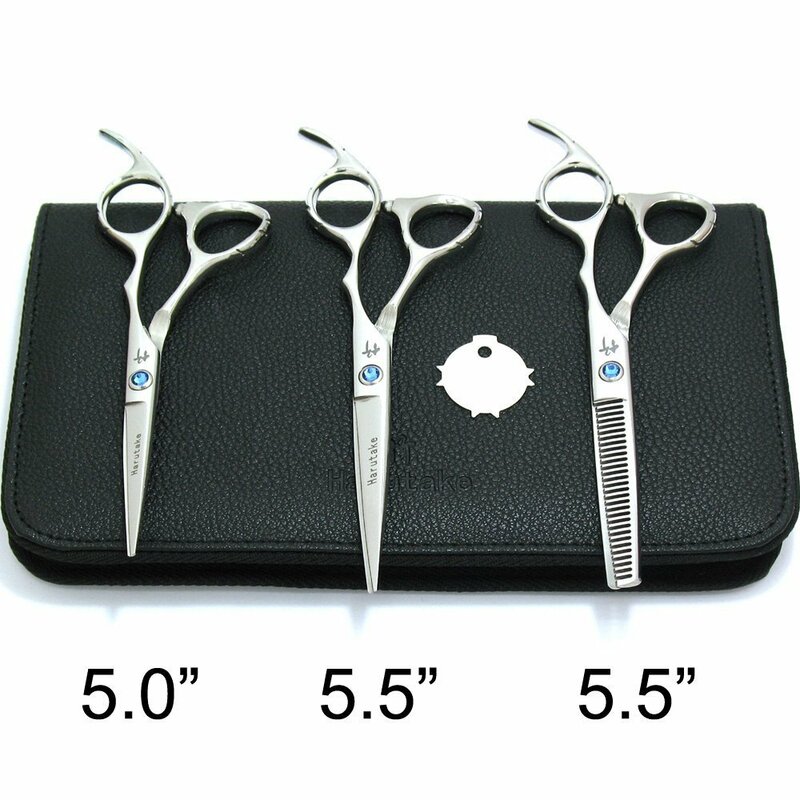 All of these scissors which are included in this set are handmade, using highest quality Japanese 440C stainless steel, thereby providing high quality, durability and thus longevity. Both 5.5” and 6.5” hair cutting shears have convex hollow ground blades which are known as extra sharp blades, but 5.5” hair thinning scissors have 30 micro-teeth on one blade and razor edge on other blade. What is very important, all of these hair cutting shears are triple-honed, therefore, they are razor-sharp, ensuring fast, precise and smooth hair cut. Another feature of these shears is hidden adjustment screw which not only looks better, because it is invisible, but also does not pull and tear the hair like some regular tension screws. They also have non removable finger rest which improves comfort by relieving the stress on wrist and shoulder. Despite the fact that these Harutake hair shears have no inserts for finger holes to adjust the size and enhance comfort, they are designed to cut hair smoothly without causing any distress to fingers and hands. It should be mentioned, that these Harutake tools come with synthetic leather case for safer and more comfortable movement. These Harutake hair cutting and thinning shears are silver color with slight polish for nice sheen. They have special bamboo style handler which features Harutake brand and name, as well as looks interesting and modern. This design stands out with hidden tension screw which is covered by light blue diamond style knob, so it becomes invisible, but at the same time performs its functions. This Harutake set includes 5.5” cutting shears, 6.5” cutting shears, 5.5 thinning scissors, as well as synthetic leather storage case. Total weight of this set is 12 ounces. All of these shears are handmade from Japanese 440C stainless steel for higher quality and longevity, and are triple-honed for better sharpness. Hair cutting shears have convex hollow ground blades, but one sided hair thinning scissors have 30 micro-teeth and razor edge blades. Both cutting and thinning shears have hidden adjustment screw and non removable finger rest, but they do not have finger inserts for finger holes. Harutake shears are silver color with slight polish, they have bamboo style handler and hidden tension screw with light blue diamond style knob. All of these Harutake barber tools come with synthetic leather case, so you can carry or keep them more comfortable. Harutake professional hair cutting and thinning scissors are suitable for hairdressing professionals.